As part of The City’s overall flood mitigation strategy, planning work has begun on a community-level, permanent flood barrier in the community of Sunnyside. In Sunnyside, flooding can happen when the flow rate is approximately 927 cubic metres per second (m3/s), which has a 10 per cent chance of occurring each year. 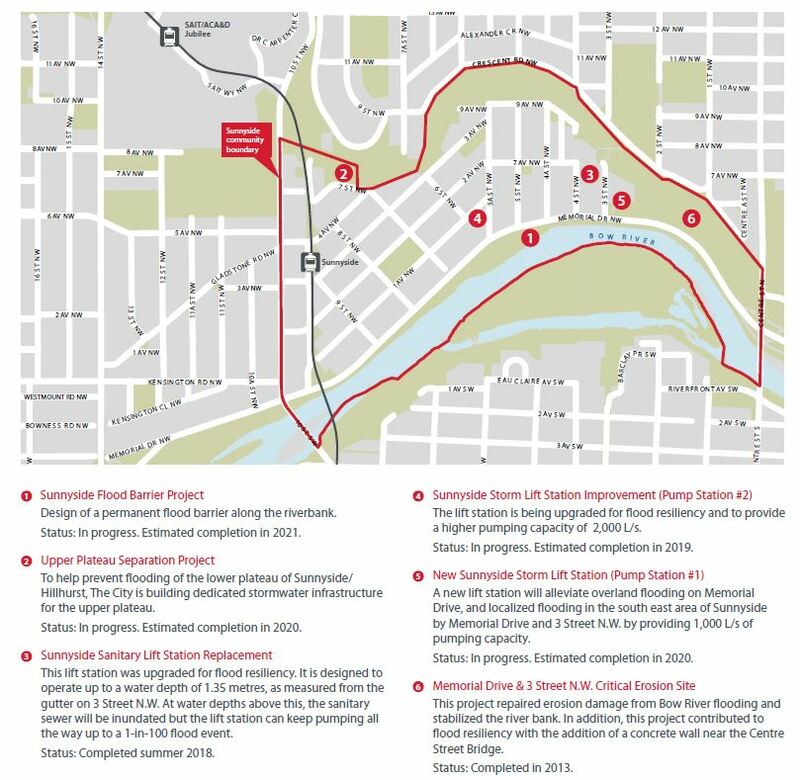 Because the community was developed so close to the Bow River, there will always be a risk of flood. That said, we can also work to lessen this risk by implementing flood mitigation measures: a key one being the construction of a permanent flood barrier along the riverbanks of the community. Currently, The City is proposing to design and construct a permanent flood barrier in Sunnyside. 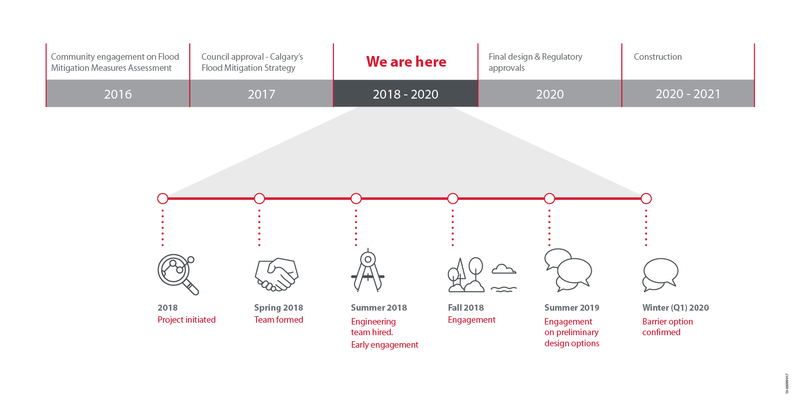 The proposed Sunnyside flood barrier is a foundational piece of the City of Calgary’s Flood Mitigation and Resiliency Plan. In conjunction with upstream storage, provided by construction of a new reservoir and modified operations of TransAlta’s Ghost reservoir for five years, it will help us manage flood water and avoid the type of damage we saw in 2013. The proposed location for the barrier is on the left bank of the Bow River. The height, length and aesthetics of the barrier will be determined after technical studies and community consultation. This project is early in the preliminary design stage. During this stage, The City along with design and engineering consultants will be gathering detailed information about the area, conducting site surveys, completing engineering studies and analyses and consulting community members, businesses and local interest groups to develop recommendations for exactly what the barrier could look like. We recognize that input from you is key to making this project a success. As we kick off the project, we are collecting input on the unique characteristics of the Sunnyside community that will need to be considered in the design. This information will help to guide the engineers and landscape architects who are working on the preliminary design for the barrier. Please see the boards that were presented at the public session here. The What We Heard Report for Phase 1 of the engagement can be found here. This feedback form is now closed. Thank you for your contributions. Based on your experiences and thoughts about Sunnyside, we would like to know what you like about the area, what you don’t like and what you think needs to be improved. Drag the map around to find a location or feature you would like to provide a comment for. Click "add marker", type your comment, and select "I like this", " I don't like this", or "Needs improvement". Add as many markers as you wish. Use the 'Address Search' to find an address, or pan the map to the general location you want to add your comment. The What We Heard Report for Phase 1 of engagement is available. Further engagement will take place in Summer 2019 with community members. We will share details of these plans on this page as they are available. Check back here for updates.